Our yard sale was a huge success, hubs lifted and carried treasures from before we met 20 years ago, three days of set up. The man who never gets rid of anything ( some call it hoarding) was on a mission, to make his wife happy and clear out the garage and basement. I promised the kids that I would turn the garage into a game room, with a ping-pong table and pool table, a fun hang out. So out went the doors and shutters and jacuzzi, and so much more! I knew a treat was needed for all of this hard work. Since it was too early for Pina Colada’s, Tropical Pineapple Coconut Bars would be just the ticket. 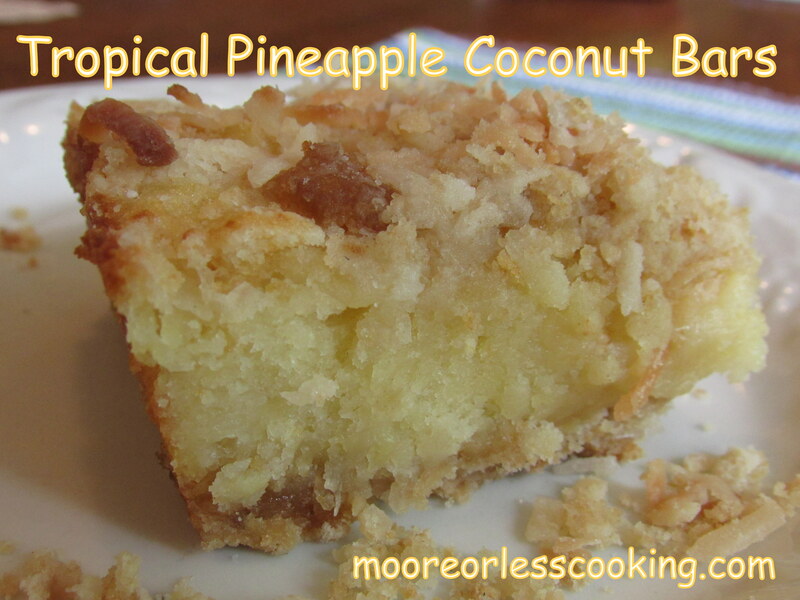 I love the delicious combination of toasted coconut and juicy pineapple. Together with a shortbread crust, these bars are wonderful. We are already fundraising for Project Graduation 2015, so I had my helpers cut and wrap each bar for our Big Bake Sale! Good Luck Class of 2015!! Garnish: toasted flaked coconut~ Don't forget! Lightly grease a 13 x 9 inch baking pan. In a large bowl, combine 2½ cup flour, coconut, brown sugar and baking soda. Using a pastry blender or two knives, cut in ½ cup of butter until mixture is crumbly. Reserve 1 cup crumb mixture for topping. Press remaining crumb mixture evenly into bottom of prepared pan. In a medium bowl, beat remaining ½ cup butter and sugar at medium speed with an electric mixture until creamy. Gradually beat in remaining 1 cup flour. Spread mixture over baked layer. Sprinkle evenly with remaining crumb mixture. Bake for 25 minutes, or until a wooden pick inserted comes out clean. 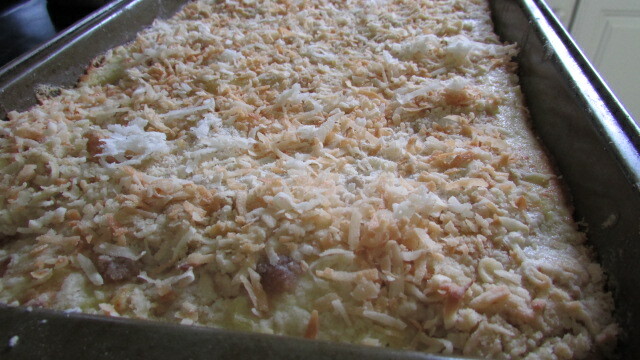 Add the toasted coconut to the top and allow to cool before cutting into squares. Looking for more delicious bar recipes? Sounds so perfect for summer. Sweet, fruity, refreshing. Yum, Nettie! Totally pinned and will be sharing on FB and Google+!! Hey, I really love the delicious combination of toasted coconut and juicy pineapple as well. Thanks for sharing this awesome recipes of tropical pineapple and coconut bars. Just found your blog. It’s wonderful. My girlfriends and I share links to blogs we find. I will now ad you to my list. I’m a big fan of “” and “Cooking With Mr. C.”. Being a mother of 5 (ages 14, 12, 9, 6 and 4) , I need more and more ideas to keep the meals interesting. Keep them coming. Bonnie L.
These look ah-maz-ing! I bet my hubby would gobble them up. Thanks for sharing. These sound so simple yet so delicious! I wasn’t somewhat disappointed in this recipe. It needs vanilla in the pineapple mixture and salt in the crust. It is very bland, but I like the texture…kind of like gooey butter cake, but it needs some tweaking.